The Gray craze is in full force and many of you are asking what paint colors go with gray furniture? Good question! Now let’s get you some answers. We all know beige, white, cream, ivory, greige will all go with gray. That’s a given. But what COLORS will go with gray? Let’s use this gorgeous sofa from CR Laine Furniture as an example. 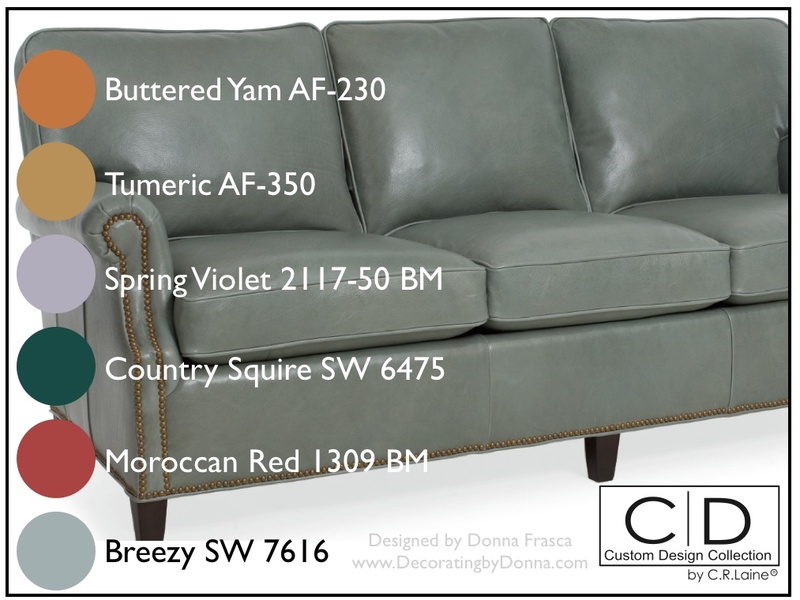 This is the Huntley Leather Sofa which is a great choice if you are in the market to incorporate gray into your home. It has classic lines, great cleanability with the leather and it’s the perfect shade of gray – not too light to show dirt and not too dark to be depressing. The great thing about investing in gray furniture is it’s versatility. It’s like the little black dress, you can dress it up or dress it down and everyone should own one. Getting back to paint colors, of course you shouldn’t just jump in a use the colors that I suggested here. They may not be the right choice for your home because of the lighting in your room, you may not like any of these colors or these colors may not relate to anything in your home. The point is, buying gray furniture is a really good investment. From light gray to even dark gray if you wish there’s just so much you can do with it. Just keep you mind open to color – all paint colors – not just the safe ones. This entry was posted in Beige, Benjamin Moore, Color Tips, CR Laine Furniture, Gray, Home Decor and tagged benjamin moore, cr laine, gray, gray furniture, paint colors, Sherwin Williams. Bookmark the permalink. 12 Responses to What Paint Colors Go With Gray Furniture? I love your color pairings with the gray – especially the Buttered Yam and Turmeric. Neutral furniture and COLOR on the walls is so smart :). light grey paint color with purples and pillows. Hmmmm, gray and green can be tricky together – watch those undertones. There are SO many colors that go with gray, about about a REAL color, a saturated one. I feel that if you keep adding gray or sage green your space will feel lifeless. I say go for more color. what brand of paint are those above? The ones with AF and BM next to them are Benjamin Moore and the SW color is Sherwin Williams. What color paint would go with a dark grey sectional? I’m thinking of a lighter grey with red accent pieces. I always liked the classic gray and burgundy color combo. You can update it with a nice sharp Tomato Red (I think that’s Valspar) for a contemporary feel.